V Australia Airlines is Virgin Blue's new airline, with which it plans to operate long-haul flights between Australia and the USA from late 2008. As owner of 49% of Virgin Atlantic, Singapore Airlines has the right to veto the use of the Virgin name outside Australia (hence they couldn't choose the name Virgin Australia). The V Australia Airlines name was the winning entry of a “name the airline” competition launched by Virgin Blue in conjunction with an Australian radio station. The short-list from which Virgin Blue chose V Australia Airlines was Amelia Blue, Australia Blue, Didgeree Blue, Liberty Blue, Matilda Blue, V Australia Airlines, Virgin Australia and Virgin Pacific. There were some 5942 entries, entries which did not make the short list included Randy Roo airlines and Choo Choo Flying Big Blue. The name "V Australia Airlines" was nominated by Teresa Manuel from Sydney. 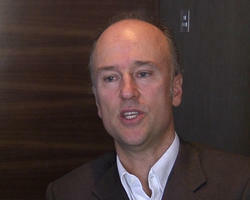 “We had an amazing response to help name the airline and V Australia Airlines stood out among the entries. It is nice and simple, easily recognised, both understated and obvious and has a clear Australian identity.” Virgin Blue's CE, Brett Godfrey. Rumours have it that Singapore Air is looking to sell its stake in Virgin Atlantic, in which case V Australia Airlines could easily be rebranded as Virgin Australia. V Australia Airlines will be competing with Qantas, United and Hawaiian Airlines who all ply the Australia-USA route. On the 24th July 2007, V Australia Airlines received approval from Australia's International Air Services Commission to fly 10 flights a week to the USA, subject to V Australia Airlines starting flights before 30th November 2007. V Australia Airlines is awaiting approval from USA regulators. 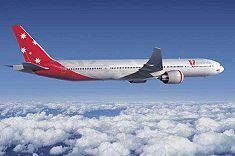 V Australia Airlines planes to operate ten weekly flights with Boeing 777-300ERs. The planes will fashion an Australian flag on their fuselages. The flights will be operated from Australia's east coast to the USA's west coast (expected to include San Francisco and Los Angeles). The name “Didgeree Blue”, suggested by Irene Wilson of Brisbane, was chosen to grace the nosecone of V Australia Airlines’s launch aircraft. V Australia Airlines is the the 4th airline in the Virgin Blue Group joining the New Zealand-based Pacific Blue, the joint venture with the Samoan Government Polynesian Blue and the budget Australian carrier Virgin Blue. Virgin Blue is owned by Australia's Toll Holdings (62.3%) and the Virgin Group (25.6%).